Illustrations and animations for social media and branding. 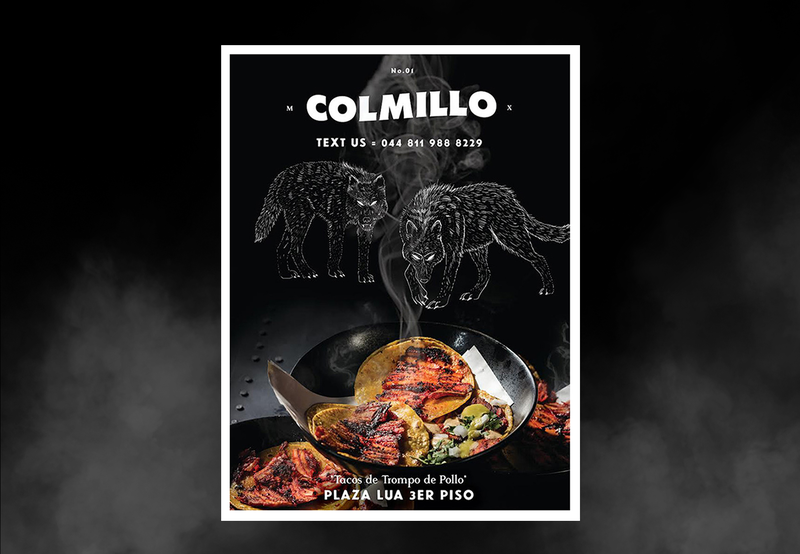 Colmillo is a restaurant located in San Pedro Garza García in the state of Nuevo León (Mexico), focus on international food and steakhouse cuts. The whole theme of the restaurant is based upon horror movies of the 50´s and mysticism, using black as their primary color. The first thing that came to mind was the idea of a dark mystic place where spirits, monsters and forbidden cults met. Our objective was to create social media content that attracted a young adult audience using the restaurant theme as our inspiration. We developed a series of animated GIF´s that were released on the restaurant facebook page and instagram, we also made some compositions using photos of some of the menu items and decorating them with illustrations, these were used on magazines and other printed media.